When someone tells me they can't be plant-based (vegan) it's rarely, "Oh I can't give up [animal product]" and usually more like "Because I live in [place]." I've been plant-based everywhere -- on a small Caribbean island for a year, in Africa, while traveling to some 35 cities, towns and villages across Europe. Sure, having a Whole Foods and Trader Joe's is nice, but it's not required. In fact, over the last 4 years, I've spent the last 3.5 nowhere near a Whole Foods Market or Trader Joe's... and I'm not alone. A couple weeks ago I asked Herbies on Facebook how they stay plant-based in a small town and tons (tons!) of people replied, offering to share their insights, experiences and tips for making it work, no matter where you live. "I live in a town of 60k in MT with one tiny healthfood store and a couple of major grocery chains, zero plant based restaurants. I joined a produce co-op which cuts my produce costs. I order a couple of items on Amazon (nut yeast and veggie bouillon). I stock up on canned beans, fruit and veggies twice a year at a case lot sale. But mostly I just use your recipes which are simple, easy and don't require specialty ingredients. When we first made the switch our grocery bill doubled, but as time went on and I figured out how to be more plant based savvy, our grocery bill has gone back down and is super affordable. And I love being able to skip over entire sections of the grocery store while shopping." "I live in a small town 45 minutes from the nearest grocery store during the -40 Manitoba winter months. Stocking up helps, frozen veg and fruit helps. It takes planning but we do our best!" "I live in a town of 450 people in Iowa with no grocery store. Nearest is a 40 minute drive and is a very small co-op with limited options. I can and freeze as much as possible in the summer as farmers markets are only available for a short time. Buy beans, rice, nuts, grains and flours in bulk. I find that vitacost is less expensive and has better options than amazon so I use them a lot. Why travel 2 hours for supplies when I can have it brought to my door for free? I take 2 days a month and cook ahead and put in the freezer and I have 2 of them that are stocked all the time with cooked rice, beans, soups, breads, pizza and pasta dishes all homemade. I make the HH chicken broth powder in a large jar and a ranch dip powder that I use often. I never eat out and have found it quite easy to live this way. I can take almost any recipe and make it plant based." "The best way to make being plant-based work is true no matter where you live- eat whole foods. Get creative with the vegetables, fruits, and nuts that are available to you. Order non-perishables online. See if there is a CSA drop-off within a reasonable distance. Grow your own food- herbs and lettuce can be window-grown year round. It just takes a little planning- it's not an insurmountable obstacle." "Seek out other Herbies. Vegan pot lucks!" "In the winter I have jars of dried beans, peas & such. I have a CSA share in the spring, summer & fall. Our local farmers' market is great. About once every couple of months I take a trip to a nearby bigger city for bulk foods I can stock up on. Online ordering has become my new helper as well." "I live in a very remote small town in Australia. I just get whatever from the grocery store. Things like nutritional yeast I buy at iherb.com (funny that it comes all the way from the US but it is much cheaper than any online Australian company). And I have a bit of a garden where I grow things that are expensive or hard to get like herbs and kale." "Buy beans in bulk, and grow your own veggies! Network with other locals. If there isn't a farmer's market, find others in the area who grow their own fruit/veg and offer a trade. And, of course, freeze meals when possible." "I've never been to a Whole Foods or a Trader Joe's. Regular grocery stores have beans, rice, vegetables, potatoes, etc! Ours even has a section for "health foods", so we are fortunate. I mostly use the Happy Herbivore cookbooks and they have everyday ingredients." "I am in a small remote town with one small grocery store. The nearest Wal-Mart is even 45 min away, not that it is the best but it's the closest variety we have. But I started a farmer's market in our town (yay! ), I buy online from Vitacost and we make trips to a larger city about once every 6-8 weeks. Like others have said I am learning to make simple, whole food with ingredients you can get anywhere. That's why I'm a Herbie follower! We also have multiple food allergies-wheat, dairy, eggs, oats, corn etc. -so this way of eating has been a God-send! Thanks Lindsay!" "I utilize the internet. You can buy pretty much any dry good known to man without it costing an arm and a leg!" "Grow what you can, can what you grow." "I live in a VERY small town and I have to plan plan plan because I have to go into 'town' to get anything out of the 'normal' southern diet." "I live a large village in the UK. Our store has a few basics like canned pulses and tomatoes and some fresh produce. Most of the time we drive (or I take a bus) to the slightly bigger town for things like plant milks and a bigger range of fresh veg & fruit. We grow stuff too. If I'm going into London (an hour on the train) I will pick up more unusual ingredients. I also get stuff on the internet." "I stock up when in town, cook in larger lots and freeze things, order from Azure Standard and Amazon, and shop at our local Health Food Store. We have 2 grocery stores in our town, not supermarkets, but pretty good, so by planning ahead on items unvailable here, we manage pretty well." "This lifestyle is very doable in a small town. In rural communities people tend to share the bounty of their harvest so that helps. I live in a very rural area with the nearest town having a population of 150. Although my neighbors probably think I am a strange hippie type they are very nice and generous. Since most greens can be grown year round in a simple cold frame, I rely heavily on them as well as nuts and beans." "I live in a small town - no Whole Foods or Trader Joe's, but we do have farmers. We have a farmers market that a bunch of locals pushed through for permits despite the push back of the grocers. We have grocers with perimeters chock full of vegetables and fruits. And when all else fails or comes short, we have Amazon.com (miso, raw bulk nuts & seeds, organic chia...) Easy peasy!" 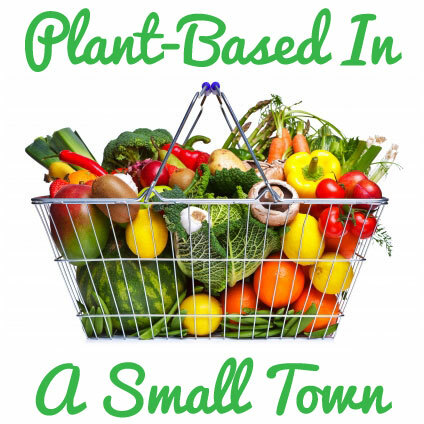 How do you make a plant-based diet work where you live?